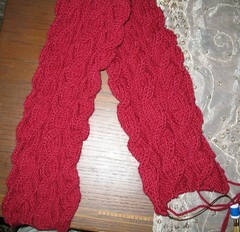 I'm chugging away on a red cabled scarf for the Red Scarf Project. It's the His/Hers Reversible Scarf from Cables Untangled, except over 36 stitches rather than 48. The color's a little off - it's really a darker red. 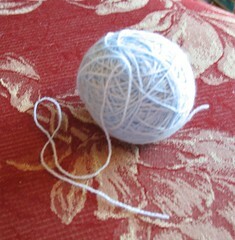 The yarn is Plymouth Encore Worsted, which should be easy care for the college kid/recipient. It's currently 33 inches long, and I'd like it to be twice that, so I need to chug a little faster! I just realized I never showed y'all this. This is the cashmere lace-weight I'm using for my sister's fingerless gloves (the second one is waiting for the red scarf to be finished). I'm very happy with this center-pull ball, which I wound using my nostepinde. It pulls much more smoothly than either store-bought center-pulls or ones wound on my ball-winder! And finally -- it's 32º F (0º C) here in San Antonio, and it's drizzling. The mere threat of daytime ice shuts everything down here. Luckily, everything's pretty much already shut down for MLK Day. Random unusual fact: San Antonio's MLK Day March is one of the biggest in the country. Why does my car hate me?